Advantages: Very large size which is great for practicing a lot of moves. Thinner material is recommended for smooth hard surfaces. Many people want to know what material is used in hockey shooting pads. Most pads are made out of High-density polyethylene or HDPE, which is a special type of slippery plastic. HDPE is also used to make milk jugs, hockey dasher boards, and rails / boxes used for snowboarding and skiing. While some hockey shooting pad alternatives offer a smooth surface, only a real hockey shooting pad can offer a smooth and slippery surface. Professional shooting pads which are 30 inches wide by 60 inches long and 3/16 of an inch thick. What shooting pad size should you choose? The smaller sizes are very affordable and good for younger players or as something to start with. 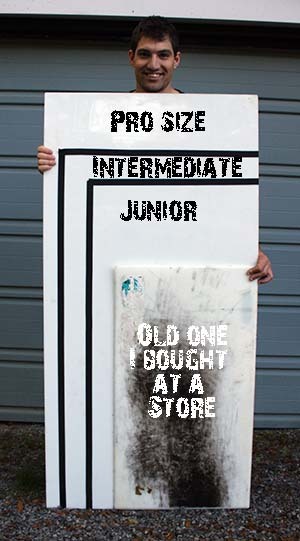 My first shooting pad was a junior size and I used it purely for shooting. If you will be doing mostly shooting than a small size will be good for you If you are older and will be using your shooting pad a lot I strongly recommend a larger shooting pad. Shooting pads usually range from $35 – $110 depending on what size you get, quality, and thickness. My shooting pad of preference is the pro hockey shooting pad because it provides a lot of room for stickhandling and passing, and I can even hook up a passmaster to the end and practice one timers. There are only a few stores that offer shooting boards. I bought my first one from National Sports (a Canadian sports store) You can also purchase hockey shooting pads online. We found that Hockey Shot has a good selection of sizes and different options. 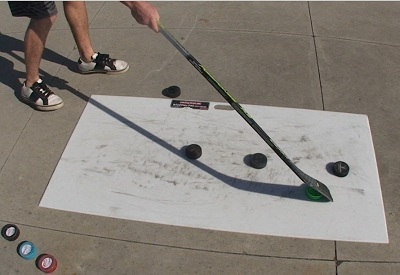 We recommend the professional hockey shooting pad, and it is the one we use the most. You can Buy a shooting pad here we also have a coupon so you can save $10 on any order over $100, enter HOWHCKY001 in the coupon code section. so i use a huge piece of plexy glass as a shooting pad, would you recommend a better shooting pad? So I have a two shooting pads in my basement, one with a boomerang passer, and the other is just a medium size. I have started to notice that the pucks don’t slide as well, and I was wondering if there is any kind of lubricant that I can use so the puck slide better. I’m looking at getting my son (6 yo) some sort of shooting pad. I’m definitely going to go with a hockeyshot pad, I was just torn between getting tiles or a shooting pad itself. The plan was, at least with the tiles, to keep the set up outside so he can use them anytime. Is there going to be any problem with this? If so, I will probably get the shooting pad because of its portability. Doesn’t practicing slap shots in sneakers screw up the mechanics when you are back to wearing skates? Should shorter stick be used to compensate for the height differences? Hey Jeremy, I’m buying for a Squirt and a Peewee who would use it in the driveway with their friends. Would you go with the Professional because its easier for them to set up with the handle, or the roll-up because its bigger and more than one can use it at a time? The squirt is the one that would use it more, but I don’t know how unwieldy the roll-up is. I just got myself the HockeyShot extreme goal and backstop, I also got the HockeyShot targets. So, I was just wondering how far away should I be from the net? Like in feet? Because I just want to practice my general aim. I want to know how do you clean the shooting pad. first of all thanks for all of your videos!!!! They are really cool. My question is regarding ROLL-UP SHOOTING PAD. Since I have a small basement and do not have space I would have to roll the roll-up shooting pad after each training. Does it make any sense or should I go for a regular shooting pad? Even though it’s a roll-up pad, it’s isn’t very easy to roll up. For convenience I’d recommend the pro size shooting pad as it’s easy to pick up and stow away. I’m 12 and about 5’6 (if that matters) and what shooting pad size should I get. I don’t know if I should get a 60×30, what do you think? I have the g1 extreme and I use it as a shooting pad.I was wondering if the extreme passer pro will attach to it. Hi, I love all of your videos and they help me so much with defense, shooting, passing and a lot more. My question was if I should make a rink with real ice or synthetic ice. Ps, I am a squirt hockey player for Comcast AAA team and I just want the best feeling and most durable one. Real ice feels the best, there is no comparison! i’m from germany and i can’t play hockey in a club, because it ist too far. also it isn’t too cold in the winter, so i can not play on a sea. I was personally contemplating on getting the roll up pad or the pro, and i was wondering which pad you recomend the most? Why? My name is Liam and I love all of your videos and I find that they help a lot but I just had 1 question and that is… How far away from my net should I be when practicing my shot? It depends what you are working on. You can practice in close, in the slot, or from the blue line distance. Everything will help you improve in different ways. Think of where you get the most chances from and practice more from those areas. My 8 year old is getting great shots from his shooting pad (hard and raises it easily), but this is not happening on the ice. If he wants I was considering getting him to practice with roller blades on or with those walking skate guards. Have you seen this before and do you have any suggestions for us? your website and videos are awesome ! Thank you for all tips you teach us!!! When I practice with a shooting pad , do my stick must be shorter than my stick I use on ice? From a French Hockey Player 😀 ! Yes it doesn’t hurt to use a stick that is a little shorter. I have a link to the sales page, all the prices will be shown there. Just bought Pro pad for my 11y son. It’s awesome! Green biscuit – very good on pavement. Does the pad require any maintenance (washing, oiling)? And does it mater if it’s painted on because that is what I paint on. Hey, I have a few questions hopefully that you can answer. I recently bought a really small training pad and brand new hockey stick, and due to the pad being too small I chipped my stick on my driveway the day I bought it. I’m curious what is the best way to go for me? I currently play Midget House League, but I’m trying out for Jr.B next year so what is the best way to go training pad wise? I’m going to be practicing everyday on my net, and I don’t want my chipped stick so should I be going with the Intermediate, Professional, or Roll-Up Pad? And if not those, should I go with the tiles? I truely don’t want to spend over $150, so if you could tell me what’s best I’d really appreciate it Jeremy! I use a whiteboard, 4 by 8 foot that I bought at Lowe’s. Spray some silicon on there and you’re ready to go! I have set up and a net and Board in my backyard, but I was wondering what distance you think is the best to practice my shot? 10 ft from net? 15 ft? 20ft? If you are in the US you can get HDPE sheets from McMaster Carr up to 4’x8′. Do you have any info on dasher boards? Most of the websites price these things ridiculously, any chance you have ideas for homemade? We play at UofWindsor they have a nice set up using chain linked fence posts as supports for the boards. They obviously got a pro set up but the fence posts I can handle, all I need is the plastic. We want to make our own road hockey arena about 40 by 90 feet. I want to know what plastic these companies are using to make the dasher boards and how I can get it for cheap? Hey Jeremy! I’m sorry for emailing you so much i just have a lot of questions, which do you like more the dryland flooring tiles or the shooting pad? Also which one slides better? Are there any differences between roll up and professional? What Skate Sharpeners would you recommend? Hey Jermy! I’m a huge fan. Would you recommend me using a junior hockey shooting pad or dryland flooring tiles? P.S i’m a squirt hockey player also which one feels more like ice? Please replay as quick as possible thanks! The Junior shooting pad is good, but in my opinion it’s too small. When it comes to shooting pads the more room you have the better so I would recommend the tiles. The tiles are nice because you can order a few to start and if you feel you need more room you can order a few more and expand the size of your shooting / stickhandling area. Can you use your real hockey stick or will it get ruined? What inexpensive gloves do you reccomend? I would recommend maybe Easton or The Warrior MacDaddy’s. They are very cheap and a good value on HockeyMonkey.com. Do you use all the space on a pro sized shooting pad or would an intermediate sized one be a good size to get space wise? I find I use all the space on the pro-sized, if you ask me the bigger the better! I currently have the dryland training tiles set up in my basement. Before those i was using the roll-up shooting pad and really liked it. what materials can be used that are primarily free. Like Billboards and advertisement signs? If you can find old boards from the rink they work great. They are made of the same material as the shooting pads, just a lot thicker and heavier. Hi Jeremy, for your off-ice practice sticks, do you cut them shorter to compensate for your shorter height (without skates) ? I’ve heard this tip from some but was wondering if this makes that much difference. Do the roll up shooting pads and regular hard shooting pads feel the same? Yeah they are basically the same material, both are very smooth. I use the roll-up because it provides more room. Are the roll up pads also made of HDPE? How much is the junior and intermidiate shooting pads?You have menchined alot in your videos the you can get coupons.How much of the price will the coupons cut? For the shooting pads you can use our coupon in the right sidebar for $10 off your order. The Juniors are about $40 but I recommend the pro-sized or roll-up pads because you will get a lot more use out of them and enjoy them a lot more. For intermediate and junior pads you can basically just shoot off of them. Whats better and closer to on ice feel Pro shooting pad or dryland flooring tiles? They both feel the same to me, but the site says the shooting tiles are the slickest. I have tried them both and they feel the same, both are great, but tiles are better if you want to expand or make a room for practicing. What shooting pad you use the most? This information is on the page. also, will furniture polish reack it? So what product could I use to make the puck glide more. Hi, I recently bought a roll up shooting pad but I have a problem. I don’t know what side to shoot on. It’s usually on the side that has a sticker but the surface is a bit tough. The other side that dosen’t have a sticker but the surface makes the puck glid more. It is the same material through the entire pad, so you can shoot from any side you like. My question is about the roll up shooting pad. I like the fact that it’s big for stickhandling but I still have questions about the durability. I tried to make my own shooting pad but after a couple of hard slapshots, it breaks. I shoot pretty hard and I can’t find any durable material. 1. If you drop a puck (real one) does it crack ? 2. Can I use it outdoor on winter time ? Hey, the roll-up pad is really durable. I have taken a lot of slapshots and it is still holding up fine. I have used it just a bit in the winter and it has not cracked, but if it got REALLY cold then there is always a chance of it happening. Can you tell me the thickness of the roll-up shooting pad? Or, at least estimate for me? The roll-up pad is only a few MM thick, maybe 5MM. It is really durable though I have been using the same one for almost a year now and it’s still doing fine! Umm does this thing actually work like i have a back yard rink and i work out all summer when and what can i use this for. i do alot of shooting, handling and drills how does this help??? I was looking for a shooting pad in surrey.Can the hockey pads be maid from plywood?Do you no where you can get the HDPE sheet at home depot?If not do you no any other place where you can? Do the screws come with the one timer??? Is 1/8 enough? I guess it is but just wanted to have your input about that. By the way, nice website. Guys, are these shooting pads available for purchase anywhere in Europe? Is there some store that re-sells them for example in the UK or Austria etc..
HDPE will work fine, as far as I know that is what the pro sized pads are made out of. If you can find it cheap then it should work. The roll-up and pro sized pads slide just the same, but I like the roll-up better because it gives you more size. Will HDPE alone work alone? Also, would the pro size slide better or worse than the roll up I am confused? hey jeremy, i was thinking bout buying the roll up shooting pad. but i was wondering if it would last me a while becuse its thin. I have been using mine for a long time and have not had any problems. 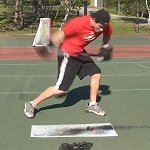 The roll-up shooting pad is my favourite off ice shooting surface, definitely recommended. Don’t forget to use our coupon as well! what is the diffrence of pro and junior? and how much dose it cost? Hi Carlos, all of that information is in the review / article. For the difference in sizes see the picture, and exact specifications above, and for prices they range from $35 – $110, you can visit the link for more info on pricing. Was looking on hockeyshot.com and they have two extreme passing kits one with the bungee cord model and the other is with the “one timer” model with a $10 difference. Which one would you get? You do delivery to Kazakhstan? I wanted buy a shooting pad intermediate size. If you do delivery ,can you say me how much it cost?